"Ruined for life”—that is the humorously ironic phrase used of young women and men who give one or two years of their lives to service in the Jesuit Volunteer Corps. The phrase was coined by Jack Morris, the Jesuit credited with having started it all—of whom more later. Although major celebrations will not occur until the summer of 2006, the whole year marks the organization’s 50th anniversary. While never a member of the J.V.C. myself, I served as a support person to a community of Jesuit volunteers in the early 1980’s, and this past fall I began contacting some of those I knew from that period, as well as others of more recent vintage. I wanted to find out how their lives had subsequently been “ruined” by their experience. Some are now married with children, some remained single and still others entered religious life—mostly as Jesuits. Those I initially came to know as their support person (we met regularly for prayer, shared meals and fun) are now in middle age and live in various parts of the country. In telephone conversations with several of them, all told me that their lives have been enriched by their commitment to the four dimensions—or values—that undergirded their time as volunteers: social justice, spirituality, community and simplicity. In distinctive ways, each of their placements involved the first of these, social justice. 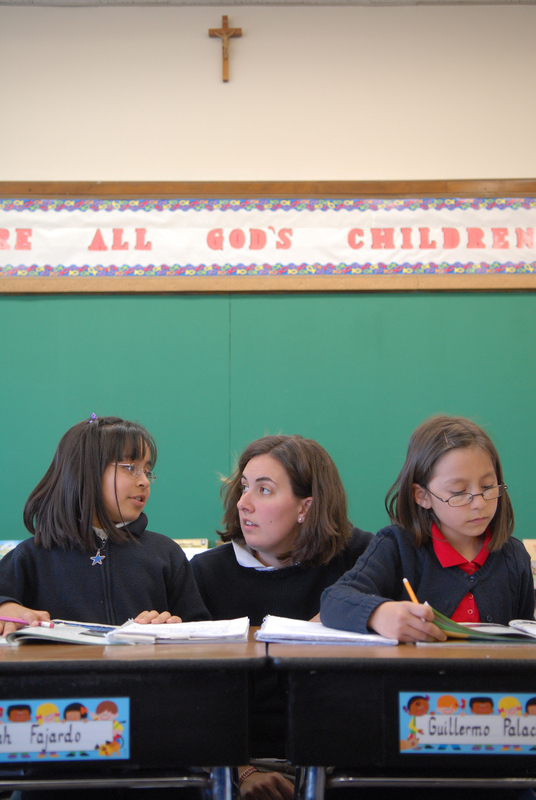 A number of the placements, though by no means all, were connected with Jesuit teaching apostolates, like the Nativity-model middle schools that serve youngsters from low-income families. Others were in a soup kitchen or similar programs that involve working directly with poor people in need of basic services. What about others whose means in later years are limited, not by choice so much as by necessity? A former volunteer who lives in Ohio spoke of her decision to give up her own job in order to remain at home with her three young children. “Living on one salary,” she said, “we waste nothing—and we’re trying to instill that into our children.” For her, the value of simplicity is not the only one that she and her husband have perforce embraced themselves, but it is one that they want to transmit to their offspring. But even apart from the need to waste nothing, she realizes that life in a comfortable suburb leads her and her husband to ask themselves, “Do we have too much?” The fact that she married another former volunteer points to a well-recognized phenomenon, namely, that having absorbed the same four values during their year of service, Jesuit Volunteer marriages tend to be built on solid foundations. Closely linked to the dimensions of simplicity and social justice is spirituality. Most volunteers begin their year with little retreat experience. “The first silent weekend retreat we had,” said one former volunteer, “was hard, because I’d had no experience in that area. I did have a director,” he added, “but she was a religious woman from the world of directed retreats—a very different world from mine, working as I was in a Nativity-model middle school, a 22-year-old full of energy.” Since that time, he noted, the Jesuit Volunteer Corps staff has developed a strong pedagogical approach that prepares volunteers for the three retreats they make during the course of their year of service. The fourth dimension, community, presents volunteers with the not inconsiderable challenge of learning to live at close quarters with other young men and women, some of whom may be very different in terms of personalities. “By the end of the year, no one was speaking,” said one woman, not entirely in jest. But for most, the year together becomes the basis of close bonds that perdure over the subsequent years. “About half of us stay in touch, and I’ve been to a couple of weddings of community members,” said British Robinson. British is one of the few former volunteers who is African American. The lack of racial diversity “did bother me a little at first,” she said. “They asked me when I first applied whether that would be a problem in community,” she added, “but I said no, because I’d grown up in an all-white environment.” She emphasized that her community experience with eight others, six women and two men, was entirely positive. So was her placement as a social worker with Catholic Charities in Mobile, Ala., in a social service agency that assists poor people with necessities like light bills, food stamps, rental assistance and other basics needed for survival. Unlike most volunteers, who join immediately after college, British had already embarked on a career in the business world. “But in my mid-20’s, I felt a call to get into full-time volunteer work,” she said, and after looking at both the Peace Corps and the Jesuit Volunteer Corps, she chose the latter. Her volunteer year was followed by graduate school, and—after a stint at Network, a nonprofit lobbying group—she began working for the Jesuit Conference in Washington, D.C., where for 10 years she held the position of national director of social and international ministries. A long-term connection of this kind with Jesuit apostolates is by no means unusual among former volunteers. She has moved on to a new position at the U.S. Department of State as senior advisor for public-private partnerships in the office of the global AIDS coordinator. Now that half a century has passed since the Jesuit Volunteer Corps began, some might wonder how it came into existence. Here again the story reverts to Jack Morris, a member of the Oregon Province of the Society of Jesus. Although he demurs from being identified as such, he is viewed as the founder. “It was just a happening that came about after the Second World War,” he said in our telephone interview. As a young Jesuit seminarian, he was teaching in a school for Native Americans at a remote mission station in Copper Valley, Alaska, with some members of the Sisters of St. Anne. As the school grew, volunteers of various ages and backgrounds began to offer their help. They were considered simply lay missionaries. It was not until the mid-1960’s, Jack said, “that I hit upon the name Jesuit Volunteers.” As other types of work were undertaken, he wrote the first descriptive brochure and began visiting Jesuit colleges and universities to recruit. The concept of the four values, or dimensions, was not formalized until later—though, as he noted, they were already being lived out in the lives of the growing number of volunteers. Initially, there were Jesuit Volunteers only in the Northwest. It fell to another Oregon Province Jesuit to open up the program in other parts of the country. As a result of his “agitating” in the social ministries offices of other provinces of the Society of Jesus across the United States, five regions were created, with their own offices and staffs: Northwest, Midwest, South, Southwest and East. Eventually, the Jesuit Volunteer Corps would take root in other countries: England, Ireland, France, Italy, Bulgaria and the Philippines. Still later, in the mid-1980’s, Jesuit Volunteers International came into existence, with small groups of volunteers serving in a dozen developing nations. Currently, the number of volunteers serving here in the United States has dropped from a high of 500 to approximately 350. This drop has come not from a lack of interest on the part of potential candidates, but to a large extent from the very success of the Jesuit Volunteer Corps model. “At first,” Jack said, “we were virtually the only organization of its kind, but now new service programs—many of them sponsored by other religious congregations—have been started. Their representatives came to us,” he continued, “and asked how we do ours, and then often replicated the basics of what we’ve done.” In the 1990’s, moreover, another type of service-related competition emerged in the form of Americorps, although it lacks the dimensions of spirituality and community found in faith-based groups that have started endeavors of their own in the style of the Jesuit Volunteer Corps. Also, as pointed out by Maggie Connelly, national project coordinator for the Jesuit Volunteer Corps as well as for the international branch, an increasing number of colleges and universities now offer possibilities for service as an integral part of their overall four-year undergraduate programs. Nevertheless, the Jesuit Volunteer Corps itself remains a creative force in the lives of the young people who commit themselves to its values, and many continue to live out those values long after their year or two of service has ended. No wonder expectations are high that the anniversary celebration scheduled for June 24, 2006, in Portland—the part of the country where it all began—will surely be a memorable one. Dont forget the JVI (Jesuit Volubteers International). I have worked with 14 wonderful young college grads during the past seven years. They have spent two years here in Arica working with drug addicts, Aids patients, abused children, and poor old men in the Hogar de Cristo, founded by St. Alberto Hurtado, S.J. I always warned them that the first year would be terrible but the second, a marvelous time that would end with a tearful departure. It certainly has changed (ruined? )their lives. None will be millionaires since all are now working for the poor in the States or are getting degrees in social work. (It would be nice for some Jesuit colleges to offer scholarships to these great people). What a great privilege to have known the Jesuit Volunteers who have gained so much from their tough volunteer experience. Now they see Christ in the poor and have come closer to God through their love for others. This article also appeared in print, under the headline "Ruined for Life," in the February 27, 2006 issue.